Paul Cornish gave me this idea with this post he did over at the Last of the Famous International Fanboys. The basic idea is to name three comics that shaped your life, and so, I'm going to do that now. I'm omitting WATCHMEN, since it's obvious and this explains what it means to me. 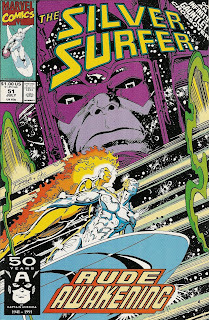 I'm going to start with the obvious, and that's SILVER SURFER #51, which I didn't know at the time was the first Ron Marz/Ron Lim issue. While I had been reading comics before then, they weren't mine - they were my brother's, and pretty much anything I would ask my dad to buy was also somehow influenced by my brother. 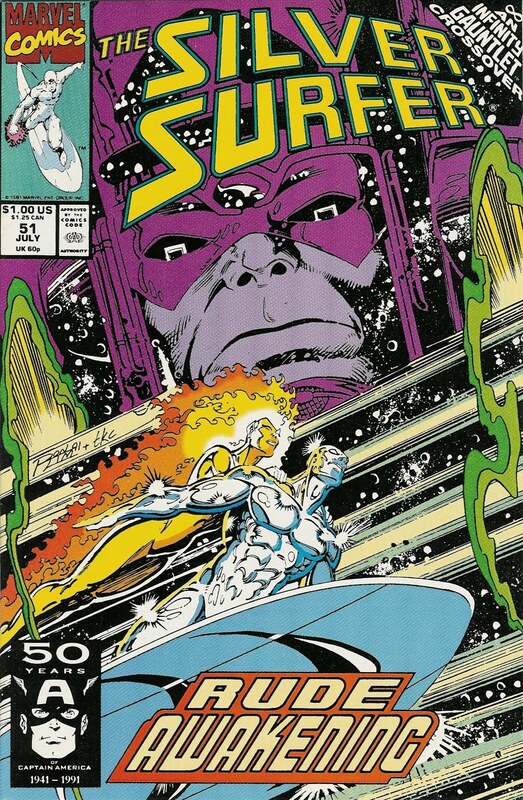 Now, although the SILVER SURFER #51 was also influenced by my brother, mainly because I asked him who the Marvel equivalent of the Flash was (DC was lame in grade school, and the Flash was my favorite) and he said "The Silver Surfer," an answer that is in retrospect completely wrong, but it's not like Quicksilver had his own comic. So, soon after that, he convinced me to buy INFINITY GAUNTLET #3, and completely of my own volition, I asked my dad to buy the SILVER SURFER Infinity Gauntlet crossover, #51. When I got SILVER SURFER #51, I thought, going in, that it would just be a regular superhero story. I knew nothing about the Surfer, and my mind was blown. For one thing, this was the first time I really wanted to draw just like someone. I thought George Perez's stuff was beautiful, but I wanted to draw like Ron Lim. But more than that, it was the sense of moral ambiguity that got me. Galactus is a cosmic being who needs worlds to live. What are the philosophical and ethical implications of him eating an inhabited world? Is it different from us wanting to eat a steak? It feels a little simplistic now, but at ten years old, it was mind-blowing. THE KINDLY ONES isn't my favorite SANDMAN book by any means, but that panel really resonated with me, and I printed it out and put it on my wall, sort of like a constant reminder and a motto of how to live my life. Finally, a whole series that changed my way of thinking is Alan Moore and JH Williams III's PROMETHEA. At the time, I was asking some tough questions regarding religion and faith, and the ideas presented in PROMETHEA really helped me make sense of things. The idea that different faiths and religions could all be consolidated into one unified vision was something I never considered. Moore's execution, highlighted by Williams and Mick Gray's art, really helped me make peace with my problems. Those are three comics that shaped my life. I'd love to hear yours. Garfield, in Spanish. These were the first comics I ever read. The Adventures of Tintin. I like adventures, intrigue, and mysteries. Groo the Wanderer, by Sergio Aragones. Because Groo is a lovable moron. None of these really changed my lives, though. Books took care of that more than comics ever did. But Garfield got me to reading, Tintin helped me realize that the comic medium was more than just pretty pictures and punchlines, and Groo kept me from taking comics way too seriously. Interestingly, I'm just the opposite. Books never really affected me - there have been maybe one or two exceptions (like the Catcher in the Rye, but everyone with any hint of a rebellious streak at 14 would say the same thing), but while I appreciate the power of the written word, I just can't think of any one novel or short story that changed the way I looked at things. It actually explains a lot, since my passions tend to fall on the left side of my brain while my skills fall on the right side of my brain. Comics hit both parts. Amazing Spider-Man by Stan Lee & Steve Ditko -- the first comic book run I ever read, courtesy of Marvel Masterworks editions checked out from the library in the early 1990s. I found a lot I could relate to in the character of Peter Parker, and Spider-Man remains my favorite character in comics to this day. Fantastic Four by Stan Lee & Jack Kirby -- again, I checked out Masterwork editions of their early work when I was a kid. Although I liked Spider-Man more as a character, I think I was even more addicted to the FF in terms of plot. 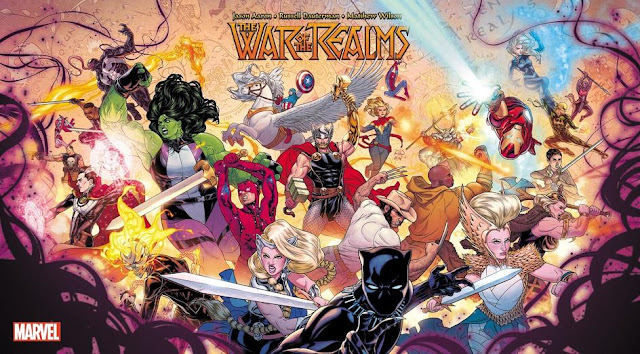 When I started reading a new FF comic, it felt like literally anything could happen. Spider-Man: Kraven's Last Hunt -- the book (again, checked out from the library as a kid) that taught me there was a dark side to comics, and that comics today were much different than the ones from the 1960s I had spent most of my time reading up to that point. Of course, my interests have expanded beyond those stories in the nearly two decades since I read those stories. But I think it's safe to say those are the comics that shaped me most, in the sense that if not for them, I probably wouldn't still be reading comics today at all. Great post. I've never read any Promethea but I've always meant to, it sounds amazing. On the way home I thought about the question of which comics shaped my life. I came up with four right off the top of my head. It might not be the list I would settle on over time, but it's probably close. Jules Feiffer's "The Great Comic Book Heroes". Golden Age reprints! It is hard to explain just how rare these were to a youngster in the early 70s. I envy current readers access to all kinds of material. Aside from getting to read the origin of Captain America, this book also introduced me to Plastic Man and the Spirit. The Smithsonian Collection of Newspaper Comics. The Phantom! Flash Gordon!! Gasoline Alley!!! And just lots and lots of other cool stuff. I've also got two comics (not hardbound!) that came to mind. Since Marc listed series instead of individual issues, I'll mention the Sgt Rock stories by Kanigher & Kubert. I would hate to try and pick just one. Finally, the individual issue that came to mind was Daredevil #47, with "Brother, Take My Hand". That story gave a very young reader very good insight into the nature of being a "hero". Marc: Great list, but would you say those are the comics that shaped you as a person? And yeah, the Fantastic Four felt like anything could happen because Kirby was on it! I think the proper Ditko comparison would actually be Dr. Strange. Paul: Although I don't have the Absolute Editions, I can just say I'm sure they're worth the price. I have them on hardcover, and I always wanted the Absolute Treatment. Lo and behold, it finally gets the Absolute treatment when I have no money. Prof: I have that DD story! It's in a Stan Lee Visionaries HC. The other DD story I really like in it is the one where he fights Namor (and loses).